Tale of Canine War Hero Succeeds on Every Level. Some film genres feel uniquely American. The war epic has been a staple of American cinema since D.W. Griffith’s The Birth of a Nation (1915) and Cecil B. DeMille’s The Little American (1917). Likewise the “Boy and His Dog” genre has produced classic films in nearly every decade: Lassie Come Home (1943), Old Yeller (1957), Benji (1974), Homeward Bound: The Incredible Journey (1993), My Dog Skip (2000), and Marley and Me (2009) among many others. So, what should come wandering into theaters across the country on April 12, 2018? Sgt. 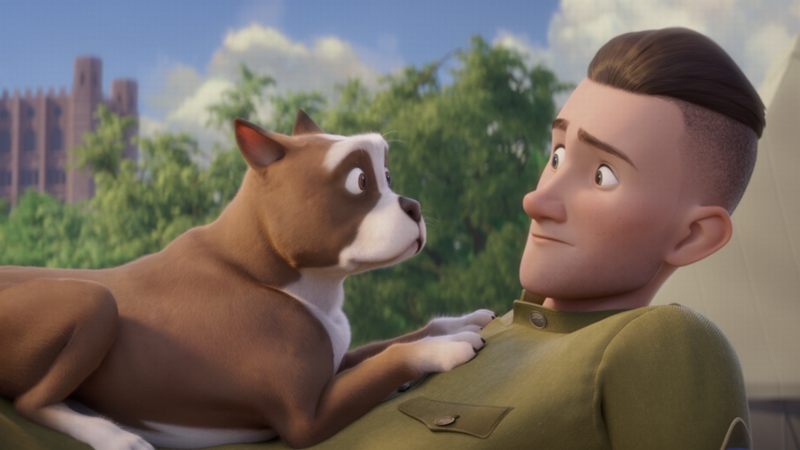 Stubby: An American Hero, a family-friendly animated film about a Boy and His Dog who served side-by-side in World War I. It’s a moving, heart-felt blend of time-honored American film genres that deserves to be seen by generations of children for years to come. The film is based on the true story of Robert Conroy, a young American soldier who befriends a stray dog as he trains to be shipped overseas in 1918. Named for his tiny tail, Stubby begins his military journey as a mascot for the unit and comedic relief for the audience. But when the action shifts to the trenches of Europe, the film and Stubby the soldier really shine. Our canine hero helps to locate injured soldiers and roots out enemies who are encroaching on the Allied positions. In one dramatic scene, Stubby warns French villagers and Allied soldiers alike that a gas attack is imminent. It’s a dog’s eye view of war and provides a tailor-made way to introduce young children to world history. Which leads us to a question that is bound to be in the minds of diligent parents everywhere: Is this film too scary for my child? At face value, a “family film” set amidst the trench warfare of World War I may sound a bit suspect. It’s not. The creative team behind Sgt. Stubby has clearly put considerable time and effort into making the subject matter appropriate for young viewers. Children of all ages attended my screening and appeared to be riveted throughout the film’s 85-minute run-time. No one was fidgeting in his or her seat. All of the young eyeballs were glued to the screen. Explosions and gunfire establish the atmosphere surrounding the characters, but we are never shown the results of the violence. Soldiers are regularly captured, not shot. Stubby helps to locate the wounded, but the implication is always that they are only “hurt” and will get better with time. The only death of a major character occurs off-screen, and the symbolic manner in which the audience learns of his sacrifice will go unnoticed by the youngest of viewers. It is a completely bloodless rendering of the Great War. Unrealistic? Certainly. Inappropriate for children? Not at all. I have written on previous occasions that I prefer animation that looks like animation, not animation that aspires to be a live action film. So, given that personal aesthetic, I found the animation in Sgt. Stubby to be truly beautiful. During a pre-screening conversation with producer Jordan Beck, he stated that the Stubby animation team was hoping to give the animation a painterly feel. In that, they have succeeded. From the jaw-dropping sequence of a warship crossing the Atlantic to a scene of Conroy training Stubby in his tent that’s rendered in back-lit silhouette, the style of the animation is perfectly mated with the subject matter being depicted. There are moments if you froze the frame that the still image would look like a Norman Rockwell painting from the 1910’s. Sgt. Stubby is a truly international effort from the mind of an Irish writer/director/producer (Richard Lanni) with a rousing score from an Oscar-nominated Scotsman (Patrick Doyle), voiceover narration by a British actress (Helena Bonham Carter) and a performance from a French leading man (Gerard Depardieu), and it’s all rendered by an animation studio with offices in Paris, Montreal and London. That said, the final product feels genuinely American. It respects both history and the intellects of its audience. It deserves to find a wide audience.